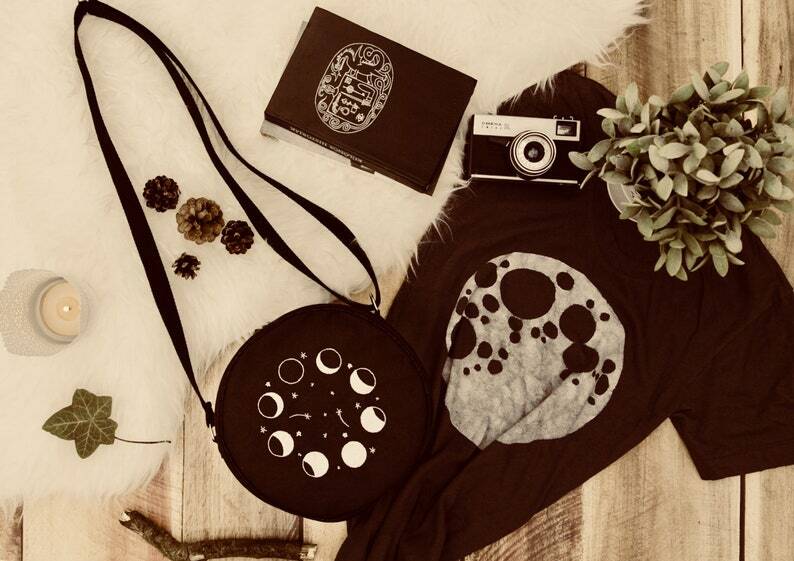 Moon Phases Round Bag, Small Shoulder Bag. It make a trendy and thought-through gift for all occasions. • Made from waterproof fabric. - Diameter: 21 cm / 8"
- Depth: 8 cm / 3"
My second order from this store and I'm sure to order more in the future. Very happy with this bag, it's sturdy and well made. The opening is a little small, but it's not a problem. This bag has amazing material and exquisite quality! The design is beautifully embroidered on and I can fit so many of my things inside the bag! I don't have to worry about anything getting wet from the rain anymore! This bag is a godsend! Shipping was surprisingly fast considering I live super far away from the sender. Highly recommend this shop, one of the best shops on Etsy honestly. If you're unsure if you want to buy something because of the price, please buy, it's worth it, trust me. Love my new bag definitely will be shopping for more in the future.